Full Root Access, Lightning Fast Servers, cPanel and WHM. Host Your VPS On Canadian Servers. VPS Hosting For Canadians Hosted in Canada! Our in-house support team in Toronto is ready to help you every step of the way. You can reach us by phone, live chat or through a support ticket. Your VPS will be connected to the Internet at 1Gb/sec on one of our 3 premium Multi-Gigabit network backbones in Canada. Managing your VPS is simple with WHM. You can use WHM's interfaces to manage accounts, email, and software on your server. VPS stands for 'virtual private server'. With a VPS you're given dedicated CPU, Memory and Bandwidth resources. How easy is it to switch between VPS plans? Our VPS's are scalable on the fly. You can switch between plans at any time with no downtime. Changing plans takes less than 30 seconds. Simply contact our sales team at any time to change plans. Do I get Full Root Access to my VPS? Yes, you'll have full root-level SSH access to your server. 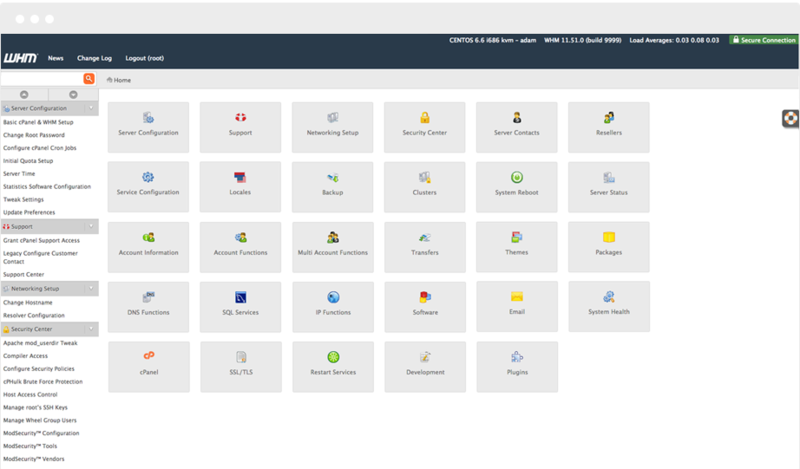 You will also get cPanel and WHM control panels to manage your VPS. Yes, you can choose to pay monthly, 6 months, 1 year, 2 years or 3 years. We offer discounts on longer billing cycles but if you choose to go monthly there are no contracts. Yes, we offer a free migration service from your current provider. We'll move your website(s) over to your new VPS free of charge. What comes pre-installed on my VPS? Do you offer a backup service for my VPS? Yes, you can subscribe to our Premium Backup Service for incremental off-site backups of your entire server. We can also configure your server to keep local backups as well. What happens if I outgrow my VPS? We can discuss either a custom VPS server or we can move you to one of our Dedicated Server plans. When upgrading we'll move everything on to the new server for you, hassle free. "We wanted a VPS in Canada and HostUpon was recommended by a friend. I'm not one to write reviews but this company has truly been a pleasure to work with. From my initial sales call to the migration from our last host, everything went smoothly. Thanks to Eric and John in support our VPS migration was simple and I can't thank you enough."